What’s the energy consumption of your Tumble Dryer? There is a significant variation in energy efficiency between diffrent models. An A-rated tumble dryer uses about a third of the energy of the typical C-Rated dryer. A C-Rated tumble dryer uses about 4kWh for a load. So there it is: 4kWh and £113 a year to run. What better reason do you need to buy a Rotaire Dryline for only £30? That’s why we fitted ours – read about it here. Last year I heard about a great British invention – the Rotaire Dryline – and wrote a post about how it can help you get rid of your tumble dryer. Now we’re in the eco-house we’ve finally got the opportunity to put one in and see if it works as well as they say. The photo is deceptively light – it’s just finished raining, and the clothes under the cover are dry. They’ve dried overnight inspite of the rain. 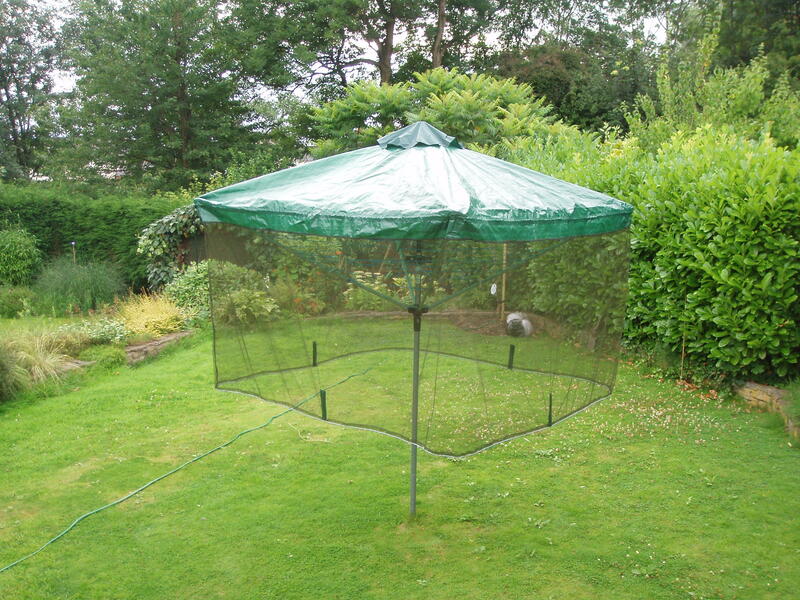 The only ones that are damp are the couple of items that were too close to the net. So that looks like success to me. We’ve yet to go through a winter with it, but at the moment we’ll be using our Rotaire rather than buying a tumble dryer! You can get them online from Rotaire from £30. Tumble Driers are a contentious item in the UK green movement – just look at all the debate raging over at Bean Sprouts. And the fact is, that if you don’t have one, but dry inside on radiators, then you’re still going to be using a lot of extra energy to dry your clothes – have a look at the figures here. 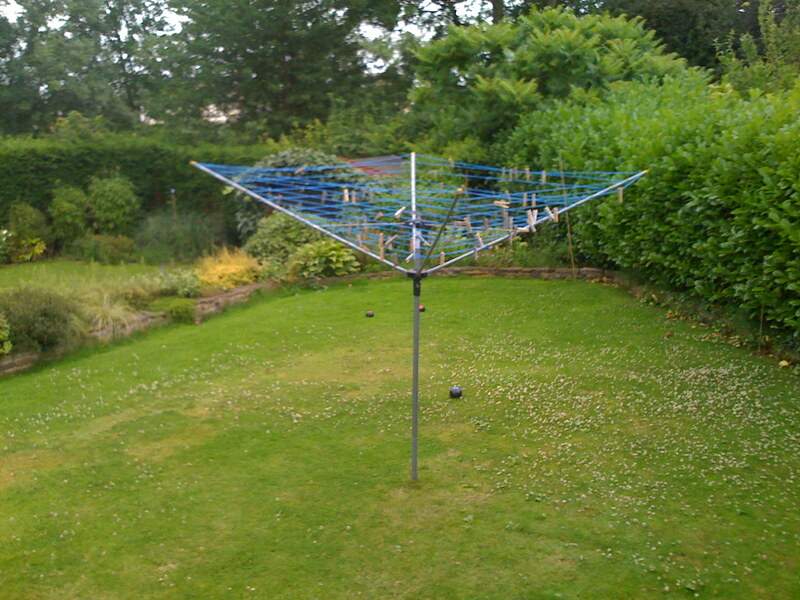 Now most of the time drying outside in the UK is an impossibility – it’s rainy or even just generally damp. So a bright spark has come up with the wonderful device in the picture – it’s a waterproof cover for a rotary airer. 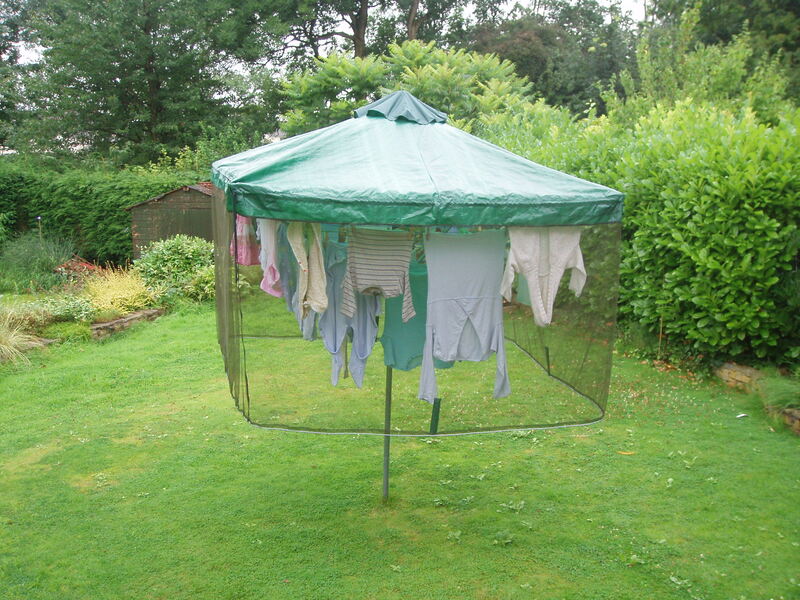 It means that your clothes will dry even on a damp Manchester day – the nets down the side allow the wind through, but prevent the rain being blown onto the clothes. I’ll certainly try one of these rather than buying a tumble dryer (how the hell would I power a tumble dryer with my Post-Peak-Oil Solar PV 🙂 anyway). You can get them online from Rotaire from £30.